Switchboard repairs and replacement switchboard upgrades. Switchboards, switchboard repairs, power points and safety switches may only be installed by a licensed electrician. All of Johns Electrical electricians are fully licenced. John’s Elec holds a current electrical licence which is required to undertake this work. We offer a safety inspection using thermal imaging cameras to find hot spots in residential, commercial and Industrial Switch Boards. This will identify potential problems without requiring expensive investigations. We provide a report with remedial recommendations and accompanied with the thermal images. Thermal imaging will identify hot spots which costs industry (and households) money due to sometimes substantial loss of efficiency in the power/switch board and high resistance. Thermal imaging program will detect a potential fire hazard which cannot be detected with a visual investigation. 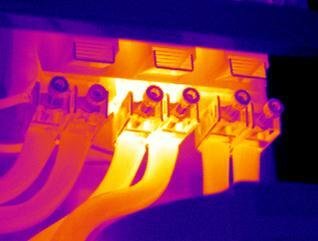 A thermographic camera scan will reveal hotspots on switchboard equipment. business disruptions and costly repairs. Thermal Imaging is undertaken without any power shutdown and is non-intrusive. The price of electricity is always rising. Halogen lights run hot and are heavy power consumers, LED lights are the most power efficient lights available in the general market today. LED Lights also will (in effect) never need replacing! (LED lights generate about 60 degrees whereas Halogen Lights are rated at about 300 degrees. JEAC will design supply and install these latest and all other conventional lighting systems, LED, Halogen, Fluorescent and Compact Fluorescent lights and offer advice on energy efficiency. Utilise RCD Protection (An RCD – Residual Current Device is a safety device that disconnects a circuit when it detects an imbalance of the electric current. Separate you switchboard from old meter panels. COMMERCIAL: Increasing power rating of existing commercial switchboards for changes in demand. From pool equipment to the specialised electrical needs of Spa Baths or power hungry household machinery and in a commercial setting Industrial machinery and other hardwired electrical devices Johns Electrical will assist you in safe and prompt installations which consider the overall power load available and factors such as location, safety switches and power usage advice.